We already told you about why you should visit Naples giving 4 reasons to do it. Naples is one of the Italian places you have not to miss. But apart from our 4 reasons, there are some others you might be interested in. Today we will talk about one of them: the Solfatara volcano. Everyone in the world knows the destruction of Pompei caused by the Vesuvius in 79 AC. But only a few knows that Naples is in a very volcanic region with a lot of really important volcanoes. 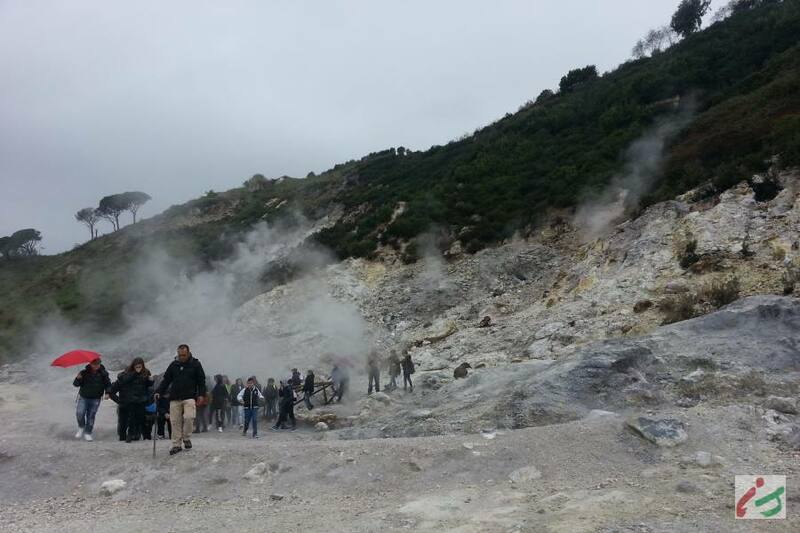 Campi Flegrei are composed of 40 ancient volcanoes, some active and some inactive, that all together create a big area with a 15 km wide caldera. This is the reason why it is considered one super volcano, like Yellowstone and Lake Toba. This kind of volcano has eruptions that could be the strongest ones, destroying everything in many kilometers and changing the entire world weather. In fact a solfatara is more dangerous than a volcano. But don’t panic: it’s something that happens only once every 100.000 years (the last one was in the 11th century!). We went to Naples in November and visited the Solfatara. It is located in Pozzuoli, just few kilometers north of Naples. This area is called ‘Campi Flegrei‘ – the origin of the name is Greek – which literally means fire fields in Italian. So that it let us imagine the real power of this land. In the Greek times, this was the place where Zeus and the Titans fought against each other and where Titans were closed in after losing the battle. In fact, when the gas came out Greeks said that Titans were smoking, when the earth shook they were disquieting and the water was salty because of Titans’ tears. In this way Greeks gave an explanation to gasses, earthquakes and thermal water. Solfatara volcano in Naples is one of the few volcanoes in the world that you can visit like a natural park. Its extension is about 150,000 square kilometers. The volcano is privately owned because during the Bourbon kingdom this area was granted to some rich families. Here San Gennaro (patron saint of Naples) and San Procolo were martyred. 40,000 years ago the Archiflegreo, the only volcano in the area, erupted for two weeks. The cave got empty and it came out the caldera. Now the cave is full of magma again, but the crater is closed. All the other volcanoes are extinguished, only the Solfatara is still active with about 30 craters. Here the earth is really elastic. It gets hotter and starts to inflate like the lid of a pot. After that all comes back to normal. In the 1980s the earth lifted up to 1,60 m.
Do you know what I mean when I tell you it was really strange to be there at the Solfatara volcano? The sensation was like there was a big pot under my shoes, that could explode in any moment in a very violent way. Of course there are a lot of controls that are always monitoring the situation and for that reason it is not so dangerous to be there. It was only really exciting! If you try to let a big stone here fall (we tried!) you can listen to a really unique effect. It seems that there is absolutely nothing under this little bit of ground, but it is not like this. The ground is made of cooled lava, that is full of air and gas bubbles. When the stone falls, it creates vibrations downward for about 10 meters. Vibrations bump into a tough rock under the cooled lava and then they come up again. That’s why it seems like there is an empty space under the ground. It is really like a big pressure cooker and you can see this hot gas coming from under your feet in some points, and in some others there is hot mud. 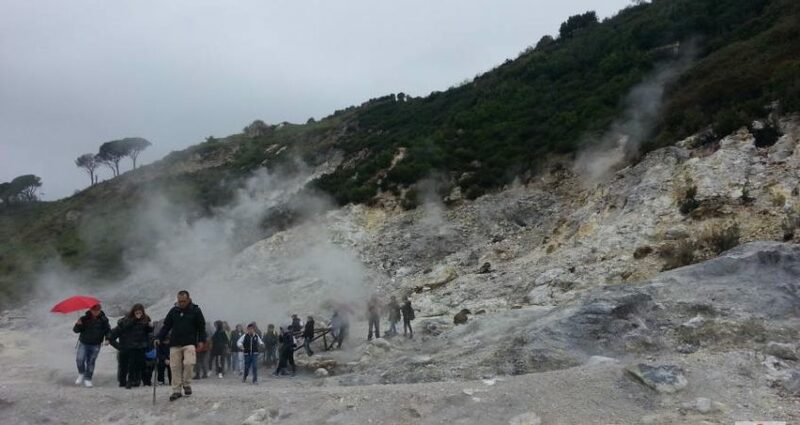 It is a great experience to walk inside an active volcano. Another thing the guide told us is that in Solfatara volcano there is the bradyseism, that means ‘slow earthquake’. It makes the ground level increases or decreases. In 1970 an entire part of Pozzuoli was evacuated because of this problem. At the Solfatara, you can see that everything around is green, flowered and luxuriant. Into your nose, the air smells because of sulfur. But inside the crater there are no plants: only stones and gasses. The volcanic soil is much more fertile than any other. The proof is around you. You can see the Mediterranean scrub, but if anywhere else plants are short (50/60 cm) here they are arboreal (2 m). Plants are also hardier than in other places. Getting to the crater – about 600 meters from the entrance – you will see the nature changing its aspect. Inside the crater plants don’t grow up because of the temperature and the high presence of sulfur. Before the crater there is such a puddle of rain where the water boils due to the components of the soil, which also don’t let the water seeps into the ground. Thanks to the sulfur here you can obtain a lot of mud. Its healthy properties were known in the past. In fact thermal water was the cure for the scabes. For example Frederick II cured himself in the Solfatara. One last thing: particular organisms leave here where the environment is similar to that of millions years ago. Well, these organisms probably are the first existing organisms of the entire world. How to get there? You can easily reach this place by the line 2 of the underground stopping at ‘Pozzuoli – Solfatara’ (800 meters far from the Solfatara). Otherwise you can take the bus leaving from Piazzale Tecchio. Where to sleep? You can sleep at Hotel Palazzo dei Turchini. It is a 4-stars hotel near the Naples’ city centre and Toledo underground stop. Tickets and opening times. The entrance ticket costs 7.00 € (6.00 € for groups of more than 15 people). Children are free up to 5 years. From 5 to 12 years old the ticket for children costs 5.00 €. If you need a private parking place is on payment. Solfatara is always open from April to October from 8.30am to 7pm and from November to March from 8.30am to 4.30pm. Sometimes it is possible to visit the Solfatara by night, the ticket is 15.00 € per person. Need further information? Write an email at info@solfatara.it. I think that the Solfatara is really an incredible place that you must visit if you come to Naples, together with a lot of other things. Naples area is a land all to discover. Would you get there? Leave a comment if you need tips or information.